In Greek mythology, Pandora was the first mortal woman, a woman crafted by the gods, possibly with the intention of bringing misery to mankind. 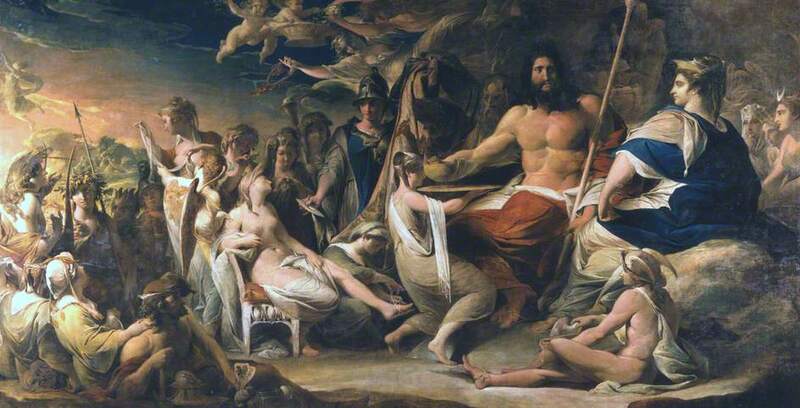 A generation of man, without women, had been made by the Titans Prometheus and Epimetheus at the behest of Zeus. Prometheus had taken great pride in his creations, and sought to do the best by them, often angering Zeus in the process. To equip man, Prometheus had stolen characteristics from the workshops of the god, fire from the forge of Hephaestus, and also taught man how to sacrifice, ensuring that they kept the best parts of the animals for themselves. Prometheus would ultimately be punished by Zeus, as he was chained to one of the Caucasus Mountains, and then tortured by a giant eagle. Zeus though, also decided to punish man. To this end Zeus instructed Hephaestus to create a woman from clay, and then Zeus breathed life into the creation. Once crafted, Athena then clothed the woman, Aphrodite adorned it with grace and beauty, Hermes gave it the ability to speak, whilst the Charites and Horai gave it beautiful accompaniments. Other gifts were also given by the gods, including cunning and the ability to lie, gifts from Hermes, and curiosity, from Hera. The creation of the gods was then given a name, Pandora, “all-gifted”. Pandora was then sent to the household of Epimetheus. Now Epimetheus had no foresight, and despite having been previously warned by Prometheus not to accept any gifts from the gods, Epimetheus looked upon the beautiful Pandora, and decided to make her his wife. 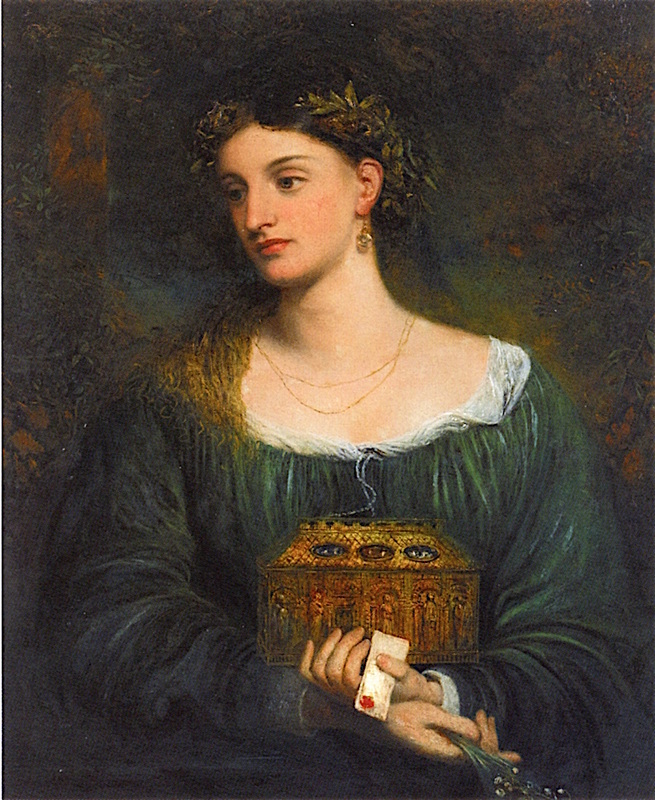 Pandora brought with her a storage jar (or chest or box), but Pandora had been warned never to open the jar. The curiosity imbued in her by Hera though, eventually saw Pandora decide to peek inside the jar. Pandora opened the stopper ever so slightly, but even as she did so, the contents of the jar rushed out of the narrow crack. Inside Pandora’s Box had been stored all the world’s evils, and although Pandora quickly closed the stopper, the likes of toil, suffering, disease, war and greed had already escaped. Indeed, the only thing left inside Pandora’s Box was Hope. The pervious easy life of man was now at an end, and life would now be a struggle. The release of the evils though would ultimately distort man to such an extent that Zeus was forced to bring this Age of Man to an, as Zeus sent the Deluge, the Great Flood, to wipe out man. There was an alternative view that Pandora was not crafted by the gods to punish man but to show that the gods of Mount Olympus could do a better job than Prometheus had done; it was just the attributes that had been given to Pandora brought strife to mankind. Pandora had no parents of her own, having been crafted by the gods, but with Epimetheus, Pandora would become the mother of the first mortal born woman, for Pandora gave birth to Pyrrha. Pyrrha would later marry her cousin, Deucalion, the son of Prometheus. Pyrrha and Deucalion would be the ancestors of a new generation of mankind after the Deluge.